The next step? Read our other two FAQ pages for more on Our Types of Shipments or on Freight Rates and Quotations. Or, you can fill out one of our handy online forms for an instant quotation on your Truckload, Less Than Truckload or International Shipment. Please feel free to call us at 855-372-7447 if you’d prefer to talk us directly or if you have further questions. What Set's FRC Logistics Apart? We have a true, fully automated online quoting system that provides instant, reliable results when given full and accurate information. Our rates are the lowest in the industry. We also provide 24-hour-a-day, 365-day-a-year shipment tracking, even for shipments that occupy less than a truckload. Is FRC's Freight Logistics Service Right For Me? a. You can ship through a parcel service like UPS, FedEx or the US Mail. b. You can use professional movers, known in the industry as "van lines." c. You can use common carriers, with FRC handling the logistics. 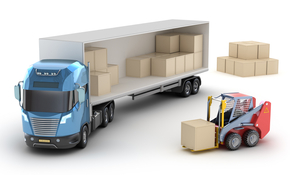 We can arrange for either a full truckload (FTL) or less than a truckload (FTL). How do you choose your shipping method? Generally speaking, you should be using a freight shipping service rather than a parcel service if you're shipping more than 100 pounds. For more than 8,000 pounds, you will probably need a partial (half) or full truck. The standard service for common carriers requires that you arrange for the loading and unloading; the driver does not have the ability to do so unless specified before the shipment is scheduled. Taking into account the size and weight of the freight you need to ship and whether or not you need loading and unloading as part of the package, get estimates for shipment by van line and by common carrier. Here at Freight Rate Central, we can give you free, fully automated quotations on our website. I Use a Local Freight Carrier. How Can Your Trucking Services Benefit Me? If you have a favorite local carrier that you usually use, but need to make a remote shipment, then ask them for a quote on the service and compare it to what we can offer you here at Freight Rate Central. You will almost certainly find that FRC can get the job done at a lower cost. In general, local carriers are fine for local shipments, but a logistics service like FRC can give you a better deal on long distance and interstate shipping. Try our instant, automated quotation service today. Why Would I Use FRC Rather Than Dealing Directly With the Trucking Company? You can certainly call the trucking company directly to find out what they're willing to offer you, but you will almost certainly pay less if you use Freight Rate Central. If you deal directly with the shipping company, you'll probably pay full price. If you use FRC, you'll benefit from our bulk discounts and from our freight management services, too. In fact, we offer as much as 75% off standard shipping rates. Can you get a discount if you talk to the trucking company directly? You might, but only if you can offer them enough work to make it worth their while, and even then, you probably won't be able to beat our rates. Can You Handle Specialized and Non-Industrial Shipments? Yes, we are happy to arrange for most types of shipments, with the exception of shipments that are less than 100 pounds and personal shipments of fragile, valuable items. For example, we can arrange for international shipment, shipment of hazardous materials, shipment of non-stackable items and trade show shipping. Please visit our Trucking Types page for more details. Also, please note that we can arrange transport by a variety of methods — not just by truck. If you can't find an answer on our website, then please feel free to call or e-mail us with your questions. Is Freight Rate Central the Company That Will Transport My Shipment? No, Freight Rate Central does not own any trucks. We're a shipping logistics company. Our job is to negotiate low, bulk shipping rates for our customers and coordinate loads, scheduling and carriers. We manage your shipments, but we aren't the ones who move them. We work with some of the top carriers in North America, and we can get your shipment where it needs to go at the lowest cost in the industry. We have trusted carriers like Schneider, J.B.Hunt, YRC, Landstar, North American, UPS Freight, FedEx Freight and many more on our team. Should We Confirm Directly With the Carrier? You do not need to confirm with the carrier, and calling them directly after booking with us could result in a double-booking. At Freight Rate Central, it is our job to coordinate logistics, and you can depend on us to manage the carrier(s). Feel free to confirm with us by phone. What's the Procedure To Follow With the Bill of Lading? When you arrange your shipment with Freight Rate Central, you will be provided with a Bill of Lading. A Bill of Lading, or BOL, is issued by FRC Logistics and legally transfers ownership of the goods from the sender to the receiver. They are also used for proof of shipment and payment. Without a BOL on board, the shipment may not be completed or the receiver might be charged for the shipment on a COD — cash on delivery — basis. This could potentially have a very negative effect on your customer relationships, so be sure that the BOL is in order. Give a copy to the carrier and keep one for your files. What If I Have a Company-Standard BOL (Bill Of Landing) That I Want to Use? If you're having Freight Rate Central act as your logistics coordinator, then you will not want to use your company BOL. Doing so will void the rate that we quoted and result in a full-price invoice from the carrier. If there's a reason why you don't want our name on the BOL, then we can prepare one that does not include our company information. However, the other information on the form will still be needed in order for you to claim your discounted shipping rate. Do I Need To Be There When the Shipment is Picked Up? The short answer is "yes." The slightly longer answer is that either you or somebody else who can sign off on the shipment and the Freight Rate Central BOL must be there when the truck arrives in order to handle the paperwork. Failing to have an authorized person present will almost certainly result in a delayed shipment and additional fees. Can You Arrange For Same-Day Shipments? Yes, we may be able to arrange a same-day shipment for you. However, it isn't guaranteed, as there may not be any carriers in your area who can take the job on such short notice. There may also be timing issues, and you should be prepared for delays. If you need a same-day shipment, then get in touch as soon as you can and we'll see if we can help. I've Scheduled a Shipment. What are My Next Steps? There are only a few things that you need to do after scheduling a shipment; Freight Rate Central takes care of the rest. Make three copies of the BOL (Bill of Lading). One is for your files, one is for the driver and the other is for the recipient. Make sure that the items you're transporting are properly packaged. Make sure your shipment is ready to go on time. Make sure that you or someone else who's authorized to sign off on the shipment is present when the truck arrives. Make sure that the trucker signs your BOL and attaches the pro label.